Yesterday, we went and voted as a family unit. Andrew beat us to the polls (pesky day job), so KidBrother Sam joined us. The plan was to go and vote, then go get coffee. Don't let the sticker fool you. She didn't really vote. And that's exactly what we did. After I was done voting, Genevieve and I went outside to enjoy the beautiful fall weather. There were two little guys tooling around on their bikes, while their (baby-wearing) mom supervised. Once their dad was done voting, they took a family photo because it was the mom's first time voting as a newly-minted US citizen. It warmed my heart, because the little guys were SO EXCITED for their mom. (Possibly, also the "I voted" stickers. Our polling place is pretty generous with the stickers.) I remember my parents' citizenship ceremony clearly, and how excited we were as a family. It was sweet to quietly observe another family making a similar memory. On our way to coffee after voting, KidBrother Sam talked about how there should be consequences to *not* voting. On one hand, he said, he doesn't want the uninformed voting. On the other, (and I paraphrase) not voting because of X arbitrary reason should be discouraged. 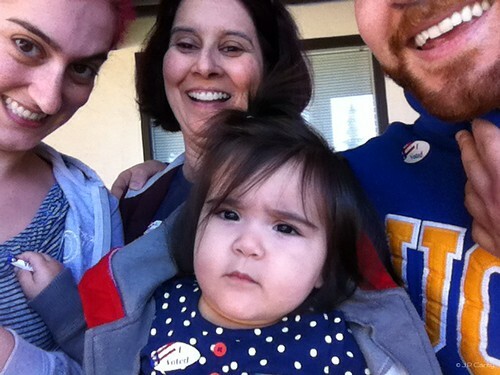 I thought about how this is Genevieve's first election, and it reminded me of *my* first time voting, about ten years ago. Our polling place used to be at the elementary school that we attended; a healthy, five-minute walk from home. After work, I parked at home and hoofed on over to have my political voice heard. "Excuse me, do you know where we put our ballots?" a little guy asked me, maybe six or seven years old, "It's my first time voting." "Actually, no," I answered, "It's my first time voting, too. Let's go ask." We both got our questions answered, and a few minutes later, I cast my first votes. I can't wait to continue our tradition of civic responsibility, followed by our morning coffee and political discussion as Genevieve gets older. She already has a lot of opinions; at the very least, the discussions promise to be interesting. In Australia we have manditory voting. I think its a great thing as it makes us more awear of our political process. sure some people put in blank ballots but i think it alows for a more representitive democracy. However, our voting system is very different to yours so i dont really know what would stop manditory voting being in place in America. We tried to make it a family event to all go vote together since our oldest two are voters as well but it just didn't work out. When my hubby and I got to the polls we were thrilled to see on the voter list that our kids had beaten us to the polls. You'l be so proud when DangerMouse can cast her vote with you.